I got a question about endogamy and Bangladeshis on of my other weblogs, as well as their relatedness to western (e.g., Iranian) and eastern (e.g., Southeast Asian) populations. Instead of talking, what do the data say? Most of you have probably seen me write about this before, but I think it might be useful to post again for Google (or Quora, as Quora seems to like my blog posts as references). The 1000 Genomes project collected samples a whole lot of Bangladeshis in Dhaka. The figure at the top shows that the Bangladeshis overwhelmingly form a relatively tight cluster that is strongly shifted toward East Asians. There is one exception: about five individuals, several of which were collected right after each other (their sample IDs are sequential) who show almost no East Asian shift. This to me is very strange. Looking at other Bengali samples, whether it be a Kayastha and/or Brahmins from West Bengal, there tends to be a noticeable East Asian shift. The Brahmins though are mostly genetically similar to Brahmins from further north and west, with a minority of their ancestry probably indigenous Bengali, judging by the fact that they usually have less than 5% East Asian ancestry (depending on your metric). I have one Bengali Brahmin in the sample. You can see it as the outlier shifted to the Northwest Indian/Pakistani populations. This individual has very little East Asian shift. In contrast, the West Bengal Kayasthas, a typical “middle caste”, look similar to the Bangladeshi samples, except they have a lot less East Asian ancestry. In other words, they would plot between the Bangladeshi cluster and the other South Asian populations. I suspect that the individuals with no East Asian ancestry may be from one of the Telugu migrant Dalit communities which settled in Dhaka during the British period. 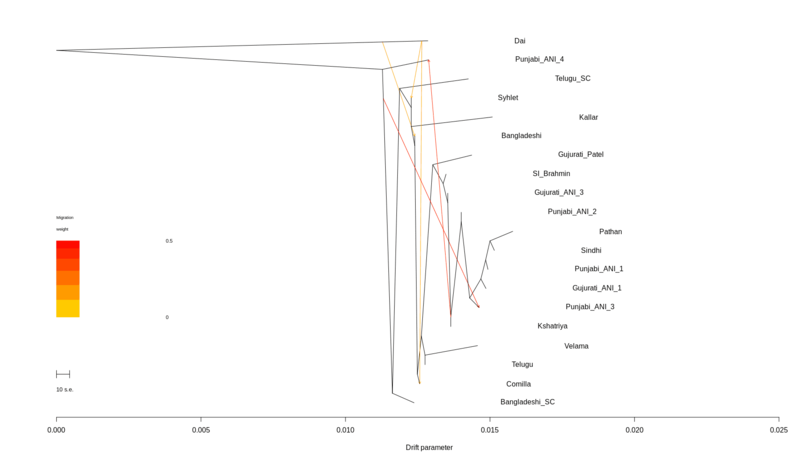 There are some other East Bengalis on the plot that I added from the SAGP. Four of them are from Comilla. Though now a city, traditionally this region encompassed the area to the south and east of Dhaka, to the border with Tripura. Two of these individuals are my parents. I also added several from Sylhet, which borders Assam to the north (Syhlet people speak an unintelligible language to standard Bengali, similar to the people of Chittagong and the Rohingya). Two things to note. First the Comilla individuals are found in the most East Asian shifted portion of the distribution. This suggests, along with the position of West Bengalis, that the eastern ancestry in Bengalis exhibits a west to east cline. My father is somewhat atypical, in that he is shifted out of the main Bangladesh cluster ever so slightly. A genealogical fact though is that his maternal grandfather was reputedly from a Bengali Brahmin family (more likely looking at the attenuated extent of the skew, his mother’s paternal grandfather was a Brahmin). Second, the Syhlet individuals seem to have something of a shift to Northwest Indians and Pakistanis. But the individual who sent me these data noted that several of the individuals have family records and memory of partial descent from Muslims from Afghanistan and such. That seems likely looking at their position. 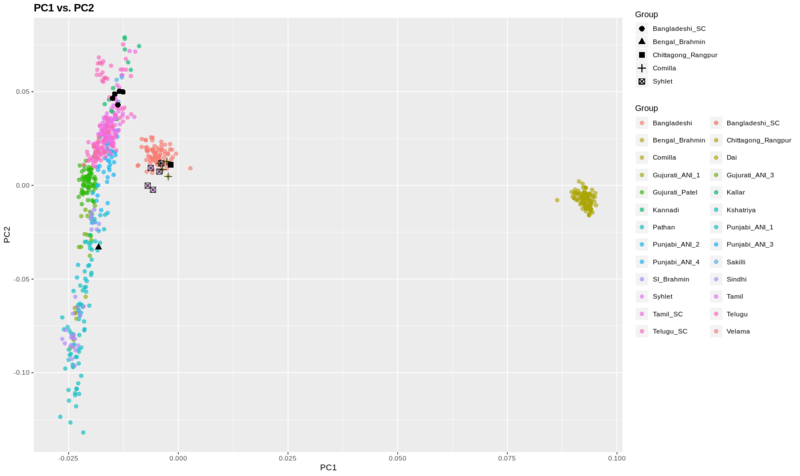 Using Treemix, it is notable to me that both the Syhlet and Comilla groups show gene flow more directly from the Dai than the Bangladeshis more generally. I think this is likely an artifact…but there is some slight structure in the Bangladesh population which is probably being missed. The eastern ancestry in Bengalis probably comes from both Austro-Asiatic and Tibeto-Burman people, and this fraction must vary across the region (or normal variation as part of Mendelian segregation). Earlier I said the Bangladeshi population is relatively unstructured. Click the Treemix plot above. Or check this Admixture run at K = 5. The Bangladeshi sample has only modest quantitative differences in comparison to most of the other South Asians. 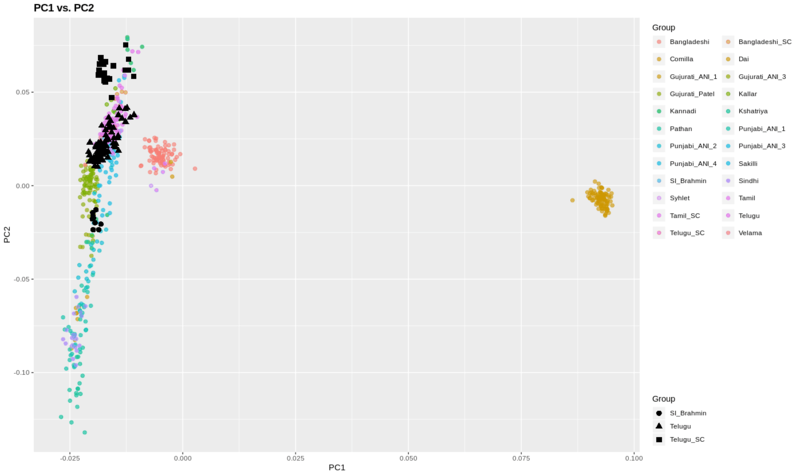 To the left are plots of Telugus sampled in the UK, along with South Indian Brahmins. Notice the relatively large range of variance. This is not atypical in sampling from South Asian populations. You see the same pattern in the Gujuratis sampled from Houston, and the Punjabis sampled from Lahore. The partial exception here at the Tamils from Sri Lanka sampled in the UK. There are a small number of individuals who cluster with Dalit groups, but far less than the Telugus. Why? I suspect that panmixia is somewhat along the way in Sri Lankan Tamil populations. So what’s going on in eastern Bengal? One thing to note is that Muslim Punjabi populations seem to have a huge amount of genetic variation. On par with what you see in Indian populations. The relatively well-mixed character of eastern Bengalis isn’t just a function of caste-less Islam. Bengali Muslims are no more strictly Muslim than Muslims from Punjab. In fact, the stereotype arguably goes in the other direction. Additionally, the variation in East Asian ancestry in Bangladeshis is significant, but aside from what are likely scheduled caste (Dalit) groups which may descend from Indian colonial migrants, I suspect that range in quantum is probably mostly due to geography. The only group of Bangladeshi genotypes where I’ve seen a higher East Asian fraction than my own is of individuals from Chittagong, which is entirely expected from on history and geography. Based on LD decay the admixture between the East and South Asian components in modern Bangladeshis dates to about 52 generations ago. That’s 1,300 years ago assuming 25 year generation times. A single pulse admixture is a better fit than two distinct events. Because of the range of physical appearance in my family, from mildly East Asian looking (I have family members who can easily pass for Malay or Filipino, at least judging by the languages people speak to them in cosmopolitan areas) to not very East Asian looking, I had assumed that a great deal of the admixture was recent due to proximity (several branches of my family lived in the princely state of Tripura; my grandmother almost killed by a rampaging elephant owned by the Maharani of Tripura). So, I was surprised that my parents both had about the same amount of East Asian ancestry (~15%). This is not entirely shocking, but consider that my mental model of the admixture process was similar to that of African Americans. So if you are a black American, and our parents both turn out to be ~15% European, rather than say 12% vs. 18%, you have to start wondering. So when the LD decay estimate suggested an older, but singular, admixture I was not entirely surprised. 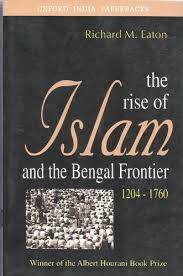 In The Rise Of Islam And The Bengal Frontier 1204-1760 the author presents a model whereby the collapse of Hindu rule in Bengal in the 13th century was coincident with the emergence of a frontier society which expanded the zone of intensive agriculture through reclamation projects. Though the expansion and settlement was directed by Muslims of originally West Asian provenance (Turanian Turks and Afghans), the settlers themselves were peasants who spoke the proto-Bengali language. Curiously, both West Bengalis and Burmese individuals have told me that there is a belief that the indigenous people of Bengal were of East Asian character. The LD decay statistics indicate that most of the admixture occurred well before the arrival of Islam to South Asia, but if settlers were drawn already from the eastern fringe of Indo-Aryan speech, then they would be more enriched to East Asian ancestry. That still leaves one to explain the west-to-east cline of East Asian ancestry even within Bangladesh (East Bengal). That is probably due to secondary admixture, combined with further gene flow from the west diluting the original admixture signal. Going back the original question in terms of affinities to western and eastern population and Bengalis. There is a northwest to southeast gradient of “Ancestral North Indian” (Iranian farmer + Indo-Aryan) ancestry in South Asia, and that is evident in Bengal. But, Bengalis clearly have a substantial minority ancestral component from Eastern Eurasia, probably via Austro-Asiatic and Tibeto-Burmans tribes. Though some Bengalis have a small proportion of distinct West Asian ancestry that is distinct from what is found typically in South Asians, that’s about one order of less magnitude significant than the East Asian ancestry. All of this was pretty clear about five years ago. The more genotypes I get, the more clear and obvious the above assertions are.